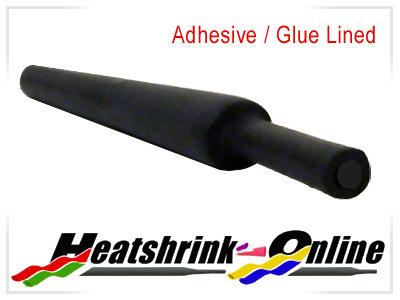 9mm diameter black adhesive/glue lined heatshrink. Shrinks down to 3mm diameter. Purchase more than 1 length and it will be supplied in one continuous length. A semi flexible heatshrink tubing with a meltable adhesive inner lining which melts and flows to seal and encapsulate components within. It is designed to provide a moisture proof sealing for a wide range of uses. Resistant to oils, fuels and moisture. Size quote is the internal diameter before shrinking.